He’s played with and against some of the most gifted footballers the world has ever seen. As a Premier League centre-half at Everton, Alan Stubbs faced Cristiano Ronaldo, Thierry Henry and Alan Shearer. As skipper of Scottish giants Celtic, he counted Swedish World Cup star Henrik Larsson among his teammates. Yet when the new Rotherham United manager was asked to describe what he looks for in a player, the first word he used was “personality”. Ability matters, of course, to the man charged with moving the Millers up the Championship table next season. But he wants big characters, men capable of imposing themselves on a game, leaders who can inspire a team, as he bids to make his mark on the English game after managing Hibernian to Scottish FA Cup glory. Rotherham have finished one place above the drop zone in each of their two seasons in the second tier since winning promotion from League One in 2014 but Stubbs believes he cam build a team capable of challenging for the top 10. Republic of Ireland international striker Anthony Stokes, who has been freed by Celtic and had a productive loan spell under Stubbs at Hibs last season, is a Millers target, although the new boss has yet to make his first signing since taking over the AESSEAL New York Stadium hot-seat earlier this month. Everton have just released a trio of players who played with Stubbs at Goodison Park, midfielders Steven Pienaar and Leon Osman and right-back Tony Hibbert. All three have extensive top-flight experience, although age is against them, with Pienaar now 34 and Osman and Hibbert both 35. Rotherham have 10 players already tied to the club, and some movement is expected this week in the case of the four out-of-contract players offered new terms before Stubbs’ arrival, defenders Kirk Broadfoot, Richard Wood and Stephen Kelly and attacker Matt Derbyshire. Stubbs, meanwhile, is aiming to start his recruitment before pre-season training begins on June 30, with toughness as well as talent on his wanted list. “It’s about building and adding to what we’ve already got,” he said. “I want to improve on what we have now. 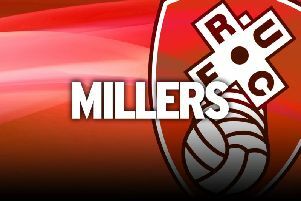 The Millers, who have confirmed a tour to Poland between July 10 and July 17, will face League One side Scunthorpe United at Glanford Park on Tuesday July 26, kick-off 7.30pm. They hope to play two matches while they are in Poland.